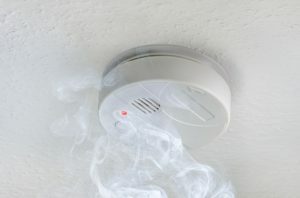 Are your smoke alarms up to date with the latest Maryland laws? Maryland has recently updated its statewide smoke alarm laws, and in our efforts to provide life safety advice as best as possible, we wanted to let you all know what kinds of changes have been made. This is a pretty decent forewarning, as homeowners and property managers have until January 1, 2018 to update their smoke alarms to the new law, but the sooner you get moving, the sooner you’ll be safer. As of January 2018, here’s what your smoke alarm setup needs to look like. All smoke alarms have expiration dates! What’s yours? Both hard-wired and battery-operated smoke detectors need to be replaced at least every 10 years. If you haven’t replaced yours since 2006, now’s the time! Location is critical when placing your smoke alarms. They’re required to be outside of each sleeping area as well as on every level of the building — basements included. For homes built before 1994, smoke alarms were required inside each sleeping area. Fire officials now recommend placing smoke alarms inside all sleeping rooms regardless of when the home was built. Safety is always first when it comes to fire detection and prevention. At G & M Services, our fire prevention services go a little bit beyond residential fire alarms. We’re certified FM 4991 contractors, and we’re expertly trained FireStop installers. To learn a little bit more about FireStop and its importance, check out a blog post we wrote about it a few months ago, right here! West Virginia: Berkley, Jefferson, Morgan, Queen Anne’s, Somerset, Talbot, Washington, Wicomico, and Worcester District of Columbia. This entry was posted on Thursday, May 19th, 2016	at 2:53 pm	. Both comments and pings are currently closed.